Are you a father who has trouble contributing to parenting decisions? Are you overwhelmed by the task of thinking and talking through various decisions you are required to make as a parent, especially in light of all of your other responsibilities (as a parent, a partner, as an employee, and so on)? Do you often find yourself deferring to your parenting partner and allowing them to make the decisions, even though you feel guilty about this later? If this describes you or your situation, know that you are not alone. 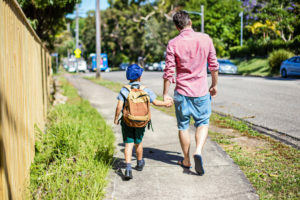 In my practice, I speak to many fathers who find themselves leaving everyday decisions—especially those involving health care, schooling, day care, and everyday activities—about their children to their parenting partners. Many of them report that as a result they feel bad about themselves and also as if they have less involvement in their children’s lives than their partner does. Some parents might consciously choose to divide the parenting tasks. I have heard several parents refer to this strategy as “divide and conquer.” This approach, which curiously describes parenting tasks as a battle strategy, can be an effective way for some parents to manage a household when there are more and more choices to make for their children but less and less time in which to make them. For many couples, however, the division of labor is not a conscious choice. Some fathers may unconsciously withdraw from parental decision-making based on unspoken dynamics within the couple, personal history in their family of origin, their individual responses to anxiety and stress, challenges from shifting gender roles (more fathers are staying home and more mothers are working, for example), and more. Any of these alone might require an individual to redefine who they are and what they do, but when withdrawal is the result, it can perpetuate a harmful cycle: Withdrawal may lead self-esteem to plummet, and this decrease in self-esteem can often lead to further withdrawal. Fear of conflict: You may avoid voicing your opinions, especially if they differ from your partner’s opinions, out of the fear of getting into an argument. This fear may not be conscious and could be operating silently, shutting down your capacity to think clearly when it comes to parenting. Learned behavior and inner conflict: Many fathers in previous generations were removed from parenting decisions. Fathers more typically served as the disciplinarians and the breadwinners, while mothers provided nurturance and daily care. Gender roles were specified and clearly delineated, making these types of decisions easier. Although gender roles have changed, traces of how your father acted as a parent likely remain in your mind. Some may feel conflicted when attempting to make parental decisions if their own fathers did not participate in these decisions. For example, you may be torn because you want to emulate your father’s parenting style but recognize at the same time that your participation may be what your family needs and desires. This conflict can cause indecisiveness and perhaps also withdrawal from the family unit. Participating fully in parenting can increase self-esteem while also facilitating the development of a deeper relationship with both your partner and your children. Anxiety: Anxiety relating to certain parenting decisions may stem from your own childhood. For instance, if you have bad memories of your time at school, you might feel anxious when attempting to make decisions about school for your children. You might worry your child will have the same negative experiences you did. This anxiety, not a desire to avoid parenting responsibilities, may lead to emotional shutdown and withdrawal. Stress/information overload: Previous generations did not have the same access to information that people do today. This lack of access to public information led many parents to simply raise their children in the same way their parents, friends, and neighbors raised children, whether or not these methods may have been ideal. Now, with information flowing at an unprecedented rate, parents can make more informed decisions. It’s also the case that many parents eventually become overwhelmed by so much (often contradictory) information. Being unsure of what advice to take or health guidelines to follow can add significantly to parenting stress—and very few parents are without some measure of stress already. Poor communication: If you feel you are not participating enough in the decision-making process, you may consider examining your communication style in your relationship with your partner. You and your partner may avoid actively discussing these issues, particularly if you disagree with one another, but discussion and open communication are essential for partnership and parenting alike. Fortunately, there are ways to remedy the issues discussed above. Participating fully in parenting can increase self-esteem while also facilitating the development of a deeper relationship with both your partner and your children. Become more aware. Awareness is often the first step, and greater awareness may be necessary before action can happen. Discover why you don’t participate in certain parental decisions. Is it because you’ve consciously decided to split up decisions? Or is something else is at play? Once you begin this self-exploration, ask yourself if one of the causes listed above might resonate with you? Do you feel skittish when you read one of them in particular? If you can understand more about why you don’t participate, it may be easier to act on one of the following steps. Talk to your partner. Talking about parenting and discussing how you feel about your role as parent can significantly open up communication channels and shift the dynamics away from withdrawal and avoidance. Partners can consider together if this is part of a shared communication style that both may need to work to improve. If any type of avoidance is well entrenched, it may be helpful to find a therapist who specializes in both couples work AND parenting. A therapist who has experience in both areas may be in a better position to help tease apart relational dynamics from other personal difficulties adding to difficulty in making decisions. Take the lead. Taking the lead to make even one decision for your children will empower you, lighten your partner’s load somewhat, and boost your confidence as a father. It’s all right to start small, and beginning to help make decisions will help reverse the trend of withdrawal and set in motion a different parental dynamic. Do your own inner work. Parenting is so rewarding because it allows parents numerous opportunities to learn about themselves. Taking steps to increase self-awareness can often help reduce or even eliminate feelings of overwhelm, incapability, and disconnect. Examining your own childhood may lead you to discover painful experiences causing some avoidance of making decisions for your own child. Or perhaps this avoidance stems from family of origin issues. Maybe you witnessed dysfunctional parenting firsthand and fear repeating it. Or maybe you operate from an ideal of the kind of father you should be and the prospect of not living up to this ideal causes you to freeze when a decision is necessary. Exploring the reasons why you might not participate enough in parenting decisions is a great way to both discover what prevents your full engagement in the family decision-making process and begin the process of working to resolve anxieties that might connect to your own childhood. If you’re struggling to do this on your own, consider seeking help from a qualified, compassionate mental health professional: therapy is a great place to address and work to overcome these issues. When I had to travel all the time for work of course I felt that there were times when I was being left out of major decisions. My wife didn’t have a choice, she was alone most of the time so she had to do what she could to keep things going in the house. That still didn’t always make me feel good because of course naturally the kids always gravitated to her because I was rarely home with them. This does not have to be some power struggle between the parents. Any good mom or dad will know when it is time to speak up and then when it is time to be a silent partner. I think that these are the things that you sort of have to learn together as you go. Why and how did it become so common for us to think that it is ok to tear down the men in our lives? Look, I know that there are a bunch of strong women out there doing things on their own, and believe me, you get my applause. But that does not mean that there are not men in our lives who are working hard and doing the same things for us. I am not sure where this change started but I don’t see it as a sign for the better. I think that it is great to acknowledge the strengths that each parent brings to the table and to celebrate those things with your children.